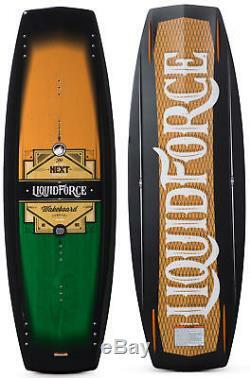 Liquid Force Next Wakeboard Mens. The NEXT is exactly what the name says... It's Bob Soven's NEXT pro model. Based on his previous board and its hull characteristics, the NEXT is a modern version that comes to us at over a pound lighter and much thinner. If you loved the speed and quickness that came out of his past model, you're going to love the fiery pop and extra response that this new revved up version provides! His new ride keeps the board extra lively. The new Vector Net weave adds a layer of unmatched torsional strength which allows the rider to stay firmly in control of the board when charging off any sized wake. If you're looking for a board that is all about quickness and explosiveness off the wake, Bob's pro model should be your NEXT ride! 3-Stage Rocker - Flatter center curve for speed & rail control - Exaggerated exit angle through tip gives a bucking pop off wake. PU Core - Compression molded to the highest standards to provide a board that is lightweight and responsive under your feet. Pro Glass Layup - Unique combination of special fiberglass weaves to give you the ultimate peformance and response on and off the wake. Vector Net Layup - Unique carbon weave adds specific strength properties to boards that your standard fiberglass cannot achieve. Boat Style - Designed and created specifically to provide you with the most enjoyment behind your boat. Venturi - Fast, yet locked into water for positive grip. Quad Blades - For that sharp, aggressive bite. We reserve the right to use either company. We take customer service very seriously. Our priority is to offer the best shopping experience possible. All emails are replied to in less than 24 hrs. For further information please send us a message or see our help desk. The item "Liquid Force Next Wakeboard Mens Sz 143cm" is in sale since Monday, November 13, 2017. This item is in the category "Sporting Goods\Water Sports\Wakeboarding & Waterskiing\Wakeboards". The seller is "djsboardshop" and is located in Saint Paul, Minnesota. This item can be shipped to United States.